the space between the arachnoidea and pia mater, traversed by delicate fibrous trabeculae and filled with cerebrospinal fluid. Because the pia mater immediately adheres to the surface of the brain and spinal cord, the space is greatly widened wherever the brain surface exhibits a deep depression (for example, between the cerebellum and medulla); such widenings are called cisternae. The large blood vessels supplying the brain and spinal cord lie in the subarachnoid space. the space between the arachnoid membranes and pia mater membranes. It contains cerebrospinal fluid. The area between the arachnoidea and pia mater, traversed by delicate, fibrous trabeculae and filled with cerebrospinal fluid. Because the pia mater immediately adheres to the surface of the brain and spinal cord, the space is greatly widened wherever the brain surface exhibits a deep depression (for example, between the cerebellum and medulla); such widenings are called cisterns. The large blood vessels supplying the brain and spinal cord lie in the subarachnoid space. 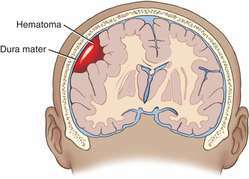 The space between the PIA MATER and the arachnoid mater, occasioned by the fact that the pia, the innermost layer of the meninges, closely invests the surface of the brain while the arachnoid, external to it, bridges over the grooves. The subarachnoid space contains blood vessels. The space between two membranes surrounding the brain, the arachnoid and pia mater. EVE causes intrathecal drug to ascend cephalad over a larger distribution which might decrease the concentration of the local anaesthetic within the subarachnoid space. Hematoencephalic barrier can be damaged too, to result in cerebral cortex atrophy, extension of subarachnoid space and lateral ventricles as well as appearance of additional centers with the reduced density in white and gray substances. 23% of cases, with a puncture into the subarachnoid space. Endoscopic third ventriculostomy, by allowing drainage of cerebrospinal fluid from the ventricles directly into the subarachnoid space (27), reestablishes a physiological route of CSF dynamics. Overall, the changes in the brain were consistent with a communicating hydrocephalus with marked periventricular and submeningeal parenchymal atrophy with secondary ventriculomegaly and expansion of the subarachnoid space. After completing its flow through the central nervous system, the CSF is absorbed by the arachnoid villi in the subarachnoid space. One intact male nematode and additional pieces of a male nematode were recovered from the subarachnoid space of the cervical spinal cord. Tuberculous meningitis develops when an asymptomatic cortical granuloma ruptures in the subarachnoid space and spills bacilli into the cerebrospinal fluid. What makes the results surprising is that in animal models, antibiotics cause bacterial lysis, leading to inflammation in the subarachnoid space. The possibility of transplanting cultured cells that release pain-relieving agents into the subarachnoid space offers a new approach to treating chronic pain in SCI.